Have you ever wished you could communicate with someone silently? In modern neurotechnology, scientists have made it possible for humans to use their brains to communicate with external systems. For example, we just read about the paralysis patient Hutchinson who used her mind to move a robotic arm. While this is a great advancement in neurotechnology, I think it could be taken further in the future, to the point of humans sending brain signals to each other. This could be a great advancement that could connect two people on a larger scale than ever before, and it would show how the brain can be a very complex system. To make this possible, a small sensor chip, much like the chip implanted in Hutchinson’s brain, would be surgically placed in each brain. This would be the chip that studies the neurons around it and send the signal to the other person. It is important to note that this would only send a signal out, not receive one. 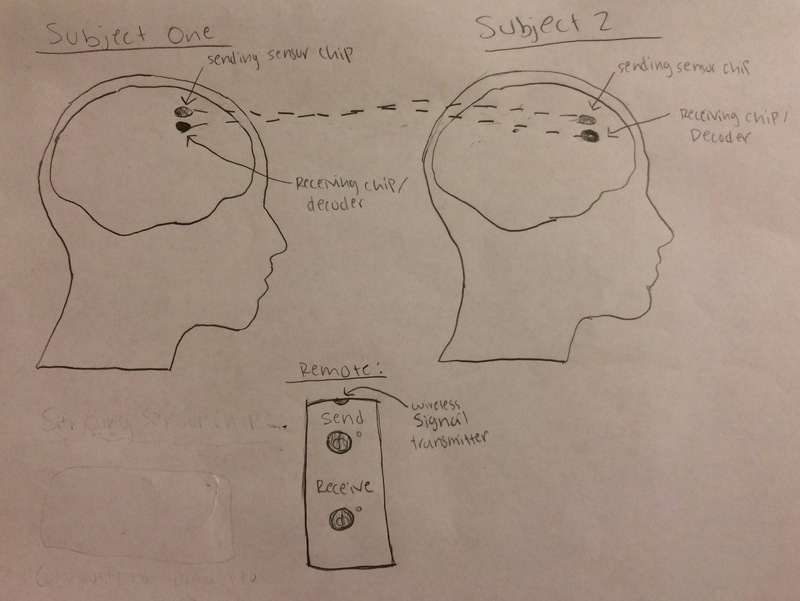 Thus, to create a send-and-receive system between two people, both subjects would also have to be implanted with a receiving chip. The receiving chip will be loaded with a complex system that sorts the brain signals and decodes action potentials, sending them to the region of the brain where they originated from. To initiate the send-and-receive response, a remote could be made for each subject with two buttons: a receiving power button and a sending power button. 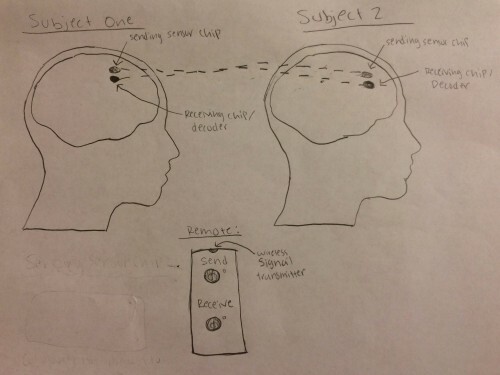 So, if one subject had both the buttons on but the other person only had the receiving button on, they could receive a signal but not send one, and vice versa. I imagine that at least at first, the system will only be able to send and receive signals that are very vague. A subject could send a signal to another subject that could prompt the receiving subject to display a feeling that is being projected in the first subject’s mind. For example, if the first subject were eating something sweet, it could send the signal to the other person, and the second subject’s mind would fire sensory neurons to show what the first subject is experiencing. Though this would appear to be a cool invention, I think that it would still be dozens of years before a system like this could be perfected. While it is very possible to implant a sensor chip that studies the neurons around it in a human’s brain today, the real struggle in this device would be the receiving chip. In order to create software that can decode neuron signals from another person’s brain, scientists would have to identify incredible amounts of neuron signals that would likely be impossible for a long time. And once scientists create the devices, there is still a large chunk of time that would have to be dedicated to testing the system on model organisms before it could be trusted to work on humans. But alas, it is important to never underestimate the future. The following picture is a brief sketch of what I infer the system would look like. The chips would each be about the size of a lady bug, much like Hutchison’s sensor was. The receiving chip would contain a much more complex system, however, because it would contain the decoding system. This entry was posted on Friday, August 1st, 2014 at 4:13 am and is filed under Sci Fi Neurotechnology. You can follow any responses to this entry through the RSS 2.0 feed. You can leave a response, or trackback from your own site. I love you invention! I read the first line and instantly thought: why doesn’t this exist already? Great job! This is really fun! One thing that came to my mind as I was reading it is that you’d need a “full brain map” from each person to know where to send the signals too in the receiving part, since every brain is different. In this case its mostly just showmanship, but one day it might lead to something like you describe. Very cool idea! The first thing I thought of after reading this is if a government spy agency used this technology to communicate and carry out super secret operations based on unpredictable situations without the target(s) finding out. This could come in handy for a lot of different things like this and for long distance communication.